Since our childhood, cartoons have been part of our lives. We copy, relate, and, follow them in many ways. Now, cartoons are not restricted to kids as adults have started using them in new ways in the form of explainer videos. Moreover, according to recent research, videos that have the power to tell a compelling story using entertaining and engaging characters can improve the conversion rate by more than 20 percent. A video is incomplete without characters. Animated characters are responsible for adding flair to a video, which further helps develop a strong brand presence. What Do You Mean By Animated Characters? Character animation is a part of the animation process, which involves bringing liveliness in characters. Animated characters play a similar role in videos to that of a film or stage actor; therefore, we call them actors with a pencil. Character animators try to make their characters look as real as possible in a bid to drive the feelings of thought, emotion and personality. Character animation is different from creature animation, as it involves the animation of photo-realistic animals and creatures. Cartoons fascinate people when they look like them. People tend to relate to them in various situations and settings thus developing an emotional connection. As the video operates with characters that speak, act, and live like viewers, they are likely to attach with them on a whole new level. About 8 billion videos are viewed on Facebook daily. The tendency of Videos to get liked on Facebook is almost twice the text content. Facebook users share videos more than 12 times as often as text and links combined. Videos generate higher ROI over other marketing tactics, confirmed by most of the marketing professionals. How do animated characters give a pitch to your explainer videos? Animated characters develop a strong connection with the viewer towards the story: the viewer experience the same feeling that the animated character is experiencing, for example, happiness, sorrow, anxiety, fear, etc., depending on the content of the video. Developing connection is a key ally to involve people in the story while encouraging them to take actions. Therefore, animated characters are good at developing a bond with your target audience. Moreover, viewers will be eager to know how the character provides the solution. When people are able to relate the characters with them, they will feel closer to them. This results in the higher engagement and more conversions. Moreover, you will be building your brand’s reliability as they perceive that you have a true interest in making their audience. Animated characters add humor to your animated video to boost engagement that you have had dreamt of! You can make your video more entertaining using animated characters while giving a memorable experience. You can even take advantage of ridiculous metaphors, wacky circumstances, unimaginable scenarios, etc., to make a video more compelling and engaging. Not only will you be delivering your business idea in an attractive and cool way, while you also make your viewers have fun. The beauty of video marketing is that you get a chance to show your creativity while presenting your brand’s features in a better way. What Are The Types Of Animated Characters? The selection of any character depends on your video’s audience and the way you are going to tell your story. You need to choose the characters that set the mood and build a connection. Cartoon Characters: If you want to present unbelievable situations to your audience, cartoon characters are the best option. They are colorful drawings that are capable of presenting different features and expressions. They turn out to be an ideal option when your end goal is to add humor or entertainment or want to describe certain features or aspects of your story. Realistic Characters: Realistic characters act like actual people and are different from typical cartoon characters. Already having an element of actuality, animators usually take advantage of their realistic proportions to engage their target audiences. In fact, these animated characters are highly convincing and they can make any story appeal real. Stylized Characters: These characters are highly generic and different from actual people in many aspects, for example, general shape and features. These are designed to attract a wider audience that is not defined; for example, a mobile app related to the health industry can be used by people of different age groups for check-ups or updates. These characters can efficiently describe any serious scenario that does not include humor to a large extent. Stick Figures: If you want to present any complicated stories where the focus of the audience is more on a story rather than characters, stick figures are ideal. Stick figures play an important role in storytelling, especially when your audience is not defined and you do not want to alienate any particular group. The content of the script is a deciding factor for the character type, tone, mood, etc. Firstly dive into what you’re trying to accomplish to decide the type of the character. After completing the task of the selection of characters, it’s time to elaborate details for the animation. Keep a few important points in mind when you start designing a character. Match the character to the audience. While using a cartoon or a realistic character, keep it aligned with your audience. To get the best results, you should try studying your buyer personas and images of prospects in your demographic to understand what they look like, type of clothing they wear, and terminology or syntax they prefer. All of this information will help you design your characters. Think out of the box and make your characters stand out to represent your brand and message well. Using common characters that every other company uses in videos will eliminate the essence of actuality and bounce away from the audience. From colors to the shape of characters, everything plays an important role in sending a message to your audience. Lighter colors set a positive image while darker colors set a more sinister mood. Keep all characters subtle to create the perfect character that could describe your brand well. The world of animation is full of characters, and it depends on your creativity in customizing characters. So keep your approach subtle and innovative and draw out unique characters. Its operating system is Microsoft Windows, Mac OS X. Description: Moho is vector-based 2D animation software. This software has two different versions: Anime Studio Debut and Anime Studio Pro. Pro version has advanced features as compared with the first version. Moreover, the Debut version is restricted to a particular length and image size. Anime Studio Pro does not support the Linux platform now. Anime Studio supports English, German and Japanese language. Its operating systems are Linux, Mac OS X, Windows. Description: Synfig Studio is a 2D vector graphics computer animation program. It is an open source and based on the free timeline. It is one of the best back-end and front-end applications. Animators can design animation in front-end and move it to backend later even on another computer. This can be done without connecting to the graphical display. Its operating systems are Windows, OS X. Description: Adobe Systems has built this program. It is a computer animation and multimedia authoring program, which allows you to create vector graphics and animation. From the creation of websites to online videos to rich internet apps, animators can Adobe Animate everywhere. This program supports video and audio embedding, ActionScript scripting, etc. Its operating systems are Linux, OS X, Microsoft Windows. Description: Pencil2D is also 2D animation software. The bitmap/vector drawing interface of the application allows animators produce simple 2D drawings, graphics, etc. A simple "pencil test" lead to the development of this animation software. Its operating systems are Linux, macOS, Microsoft Windows. Description: Opentoonz is a great open-source 2D animation software that has a pro version named as Toonz Premium. This software is ideal for creating different films and games, for example, Futurama, Anastasia, Asterix in America, etc. Description: TupiTube is an open-source application to create and share 2D animation content focused on children, teenagers, and amateurs. The main feature of this tool is the easy animation creation process, which includes only 5 simple steps. Uplift your cartoon videos using the hacks mentioned below. Complete customization: Sync the features of your video with the characteristics of your target audience to boost up engagement and develop brand’s loyalty. High quality: Hire professional video makers with advanced skills in video production to raise the number of conversions through your marketing video. The right length: Don’t stretch it too long as it would bore your audience. Keep it out of maximum 60 and 90 seconds and try to pass out your key messages within this time frame. A professional voice-over: When chasing visuals, don’t neglect the importance of audio. Make sure the voice over should have a native speaker of the language of your target audience as it will give personality to your video while making it more generic and understandable. Branding and colors: Do you know the theory of colors in video marketing? It means using the colors of a brand in a video to make easy for viewers to find out who behind the product is. For example, Uber has stuck to the color white in their animated marketing video. Cartoons are going to stay forever. As they take out us from boredom by entertaining and educating on a wide range of topics, companies have started using these cartoons for marketing. Moreover, they are better at giving expressions as compared to humans; cartoons seem to be more convincing an audience when it comes to brand development. 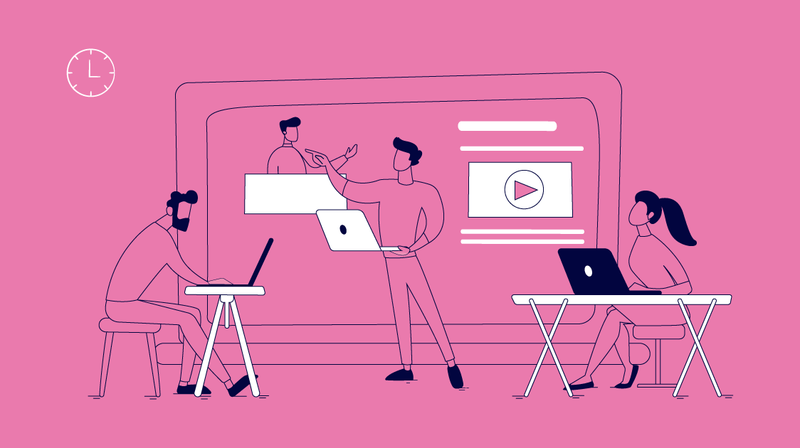 No matter what type of business you run(B2B or B2C), you can optimize your marketing efforts with a great explainer video which straightway hits the minds of viewers.